Understanding The Basics Of Detoxification. Why Is That Important? Many of us are well aware that chemicals, pesticides, hormones and other pollutants are found in all the processed foods we eat, leading to chronic illness, depression and obesity. Toxic agents are everywhere in our world. The food we eat, the air we breathe, the household cleaners we spray, the electronics we use on a daily basis… Nevertheless, toxic free radicals are made in the body as well. Stress hormones, emotional disturbances, anxiety and negative emotions all create free radicals as well. Living without toxic buildup is virtually impossible, which is why our body has built in mechanisms to deal with toxic excess. Crying, sweating, urination and defecation are all natural protocols employed by the body to free itself of toxins. Because toxins are part of our daily life, both inside and out, it may seem that they are a natural part of living and that additional measures to deal with them are needless. This, in part, is true. Free radical exposure is part of our life, however, with the overabundance of chemicals and pesticides in our foods and environment, and the increasing levels of stress in our society, our body is overcome with toxic buildup and needs further help in expelling unnecessary waste material. Different tissues detoxify in varying ways. There are five primary organs or pathways of elimination: the intestines, liver, kidneys, lungs and skin. Lungs can detoxify by eliminating gases (gas anesthetics are removed from the body by the lungs). Skin can detoxify by reducing the penetration of toxic substances (toxins in water don't get in through the skin well; however, toxins in oils do penetrate easily). Digestive System can detoxify by eliminating toxic foods, by either vomiting or diarrhea. Kidneys detoxify by secreting toxins or filtering toxins out of the blood into urine. Liver detoxifies by changing the chemical nature of many toxins. Additionally, there are three supporting channels: the gallbladder, lymphatic system and blood. Each organ detox purpose and process will be discussed separately. Detoxification is what your body’s chemistry does to rid itself of any unwanted chemicals, whether the chemicals are left from your own metabolism or go into your system from the air you breathe, the food and water you intake, substances you put onto your skin or use to treat your hair, or toxins and allergens produced by the germs that dwell in your intestine. “Detoxification handles waste not only from the environment, but also from every process in all the organs and systems of the body”. Ref: Dr. Sidney Baker, specialist in environmental and biochemical aspects of disease. As you might have already learnt HERE we are dealing with two major types of toxins if we classify by source of entry: Exogenous and Endogenous. Exogenous toxins (exotoxins) originate from sources external to the body, which includes environmental pollution (e.g. water, soil, air) as well as food-borne toxins). Basically the chemicals that are made outside of your body and can damage your cells if they are ingested, inhaled, or absorbed into your bloodstream through some other channel. While it’s unrealistic to live and work in an environment that’s free of exogenous toxins, you should strive to minimize your exposure to the following most common exogenous toxins. Emotional factors (e.g. stress, anxiety, grief and depression) are also included in this exogenous toxins category. Endogenous toxins (internal or endotoxins) are actually the by-products of the metabolic. Endogenous or metabolic toxins are toxins that are manufactured inside of your body. Some of these toxins are waste products from normal metabolic happenings – carbon dioxide, urea, and lactic acid are examples of endogenous toxins that your body tosses out by the second. The other examples of Endogenous toxins are the activities of certain naturally occurring bacteria and yeasts which inhabit the bowel, viral or bacterial infections, along with those formed by the body itself (otherwise known as autogenous) as a part of normal metabolism. Unless your health is severely compromised, your body is well fortified to eliminate these endogenous toxins from your system. An often disregarded source of endogenous toxins is an unhealthy gut. Over time, a diet that’s rich in highly refined foods, poor eating habits (lack of chewing is a big one), and emotional stress can lead to an unhealthy balance of microorganisms in your gastrointestinal tract, a state that’s called intestinal dysbiosis. Intestinal dysbiosis is accompanied by steady creation of endogenous toxins by unwanted yeasts, fungi, bacteria, and in rare cases, even parasites. These toxins include various aldehydes, alcohols, indols, phenols, and skatols, just to name a few. While some of these endogenous toxins are eliminated as gas, some make their way into your bloodstream by traveling through your intestinal walls, and once they make it into your bloodstream, they can get into your cells. Interacting in the body, endotoxins cause symptoms of chronic illnesses; treatment of diseases does not bring results. When our excretory system cannot handle removing heavy toxins or manage doing it on time they move with currents of blood and lymph flow, or amass in the extracellular matrix, which is the largest tissue filter system. It’s normal for our cells to contain some toxins at all times. After all, our cells need to manufacture energy on an ongoing basis, and the manufacturing process results in waste (toxin) production. The good news is that your body is intended to regularly gather up and remove toxins from your cells. Most of the toxins that are stirred up from your cells are broken down in your liver, and then eradicated from your body via your kidneys, colon, skin, lungs, and mucus linings in your nose and ears. As I mentioned earlier, every time that you urinate, defecate, exhale, cough, sneeze, and experience an inside out reaction with your skin, your body eliminates toxins from your system. How Your Detoxification System Protects Against Degenerative Diseases? 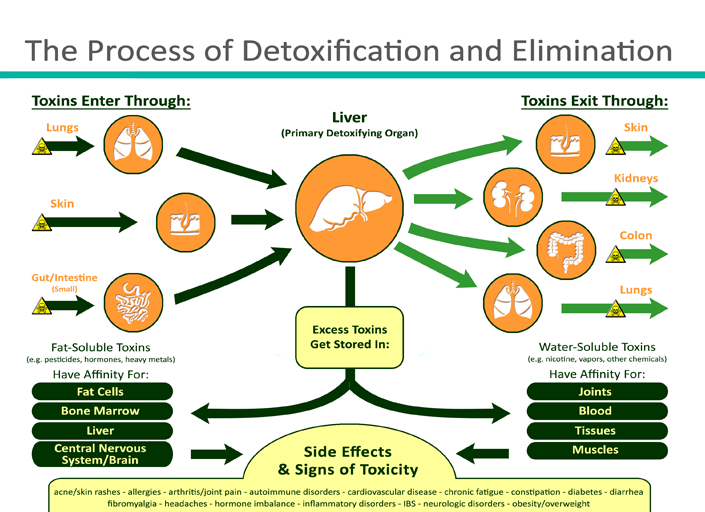 The detoxification organs protect the body from the possibly harmful toxic substances that originate in the outside world and that reach us via food, air and water, or are produced within the body. Nearly every organ of the body comprises of specific enzymes that participate in this process and help protect that organ from toxins. The instruction for the assembly of these detoxifying enzymes is buried in the genes. Depending on their genetic inheritance factors, individuals have very different detoxification abilities. 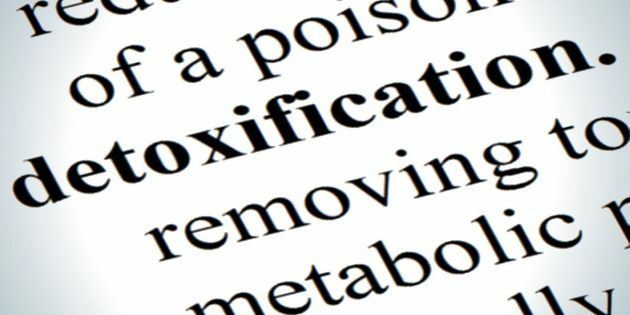 You have probably wondered, just as I have, why two healthy individuals who have been exposed to the same toxins have widely varying reactions. One person may feel fine, while the other one may develop weeping eyes, a runny nose, irritation of the throat and lungs and a headache. The answer is that even though the exposure to pollutants may be exactly the same, one person is able to mobilize their detoxification enzymes while the other cannot do so and undergoes a toxic reaction. Our first aid to the body is to relieve it from the burden of waste and toxic substances so that its governing self-healing mechanisms can function again. An injury of the basic regulatory processes can lead to the “regulatory freeze” which is distinctive in cancer. In this case, the body does not properly react to health challenges and the person only appears healthy. Cancer patients sometimes show no sign of illness for years before a tumor manifests. Read about Six Phases of Intoxication. Detoxification is a pivotal step towards renewal of the body’s regulatory mechanisms and towards reversal of cancer cells to the behavior of normal cells. Normal cells are programmed to die when they have fulfilled their task. This programmed cell death is called apoptosis. Microorganisms found to be contributory factors in chronic degenerative diseases and cancer, thrive in a toxic endogenous bodily environment. Cancer cells produce high amounts of toxins that hinder immune functions, damage tissues, cause weight loss and other problems. The more cancer spreads, the bigger the load of toxins, which diminishes the possibility to control the development of the disease. When cancer cells break down at a high rate due to chemotherapy and radiation, toxic products of tumor breakdown accumulate in the body. It is very important to assist the body in eradicating them. The success of these efforts may decide whether the therapeutic endeavors will be effective or not. With all the statistics and research that is done on the topic, whether one suffers from cancer or a chronic degenerative disease, every effort should be made to better the function of the organs of detoxification and excretion, such as the liver, kidneys, colon, lung, skin and lymph system by herbal preparations, supplementation of nutrients, vitamins, minerals, anti-oxidants, high fluid intake, enzyme therapy, lymph drainage, colon hydrotherapy, chelation therapy, enemas, glandular therapy, etc., according to individual needs. A detox is an extremely effective way to deal with illnesses that conservative medicine cannot cure. Detoxification is so important because it can literally reverse the symptoms of illness and change your life. However, when employing any type of cleanse (like a juice cleanse, liver and gallbladder cleanse, elimination diet, heavy metal cleanse, etc.) it is important to first cleanse the kidneys and colon, as these two eliminative organs are responsible for carrying toxic waste out of the body. If they aren’t cleared of blockages, you can end up with even more toxic buildup, as the toxins that are being ejected have nowhere to go. Herbal formulas are especially good at cleansing the kidneys. Colon hydrotherapy, enemas and Epsom salt cleanses are all first-rate ways to cleanse the colon. The proper fasting program and detoxing are also excellent preventative methods as most diseases start in our digestive tract and organs. One of the most significant benefits of fasting on this program is that it thoroughly cleans and detoxifies the bloodstream. This leads to a purging of toxins and waste materials from the whole body. Juicing your food floods your body with live enzymes and a profusion of antioxidants that help not only counteract free radicals but also strengthen and support the immune system, reduce blood pressure, improve sleep, concentration and memory, improve circulation and upsurge energy. Antioxidants even have anti-aging properties! They are literally a life-changing miracle food, and juice cleansing is an excellent way to inundate your system with them. There are certain unpleasant side effects that go along with detoxification as your organs let go of the accumulated plaque that has built up over the years. Headaches, nausea, diarrhea, constipation, irritability, light headedness, fatigue and trouble sleeping are all completely natural side effects to detoxification. But it’s worth all the efforts and unpleasant experience you might have. You will be amazed at how differently your body feels. If this is your first attempt at detoxification remember that years of toxic build up may be challenging to release. You may have heard a lot about detoxing or detox diets and are willing to learn how to choose the right one for you. Learn more what kind of detox suites you the best here. Just a word of caution: aside from choosing a healthy diet, certain detoxing plans aren’t for everyone. You should pursue medical advice before you start a detox program even if you attempt detox when you’re feeling relatively fit and well. But if you’re ill, convalescing, taking prescribed medications, pregnant or breast-feeding, or you’re simply not confident deciding, seeking medical advice is an absolute must. Toxicity may be related to many health concerns. Proper assessment is important to optimizey your health.